Gyalwai Nyugu Rinpoche (Tib.རྒྱལ་བའི་མྱུ་གུ, Wyl. rgyal ba'i myu gu) or Tsultrim Gyamtso Rinpoche (Tib. ཚུལ་ཁྲིམས་རྒྱ་མཚོ་, Wyl. tshul khrims rgya mtsho) (b. 1975) is one of the foremost disciples of Lama Achuk Rinpoche (1927-2011) who founded the monastery Yachen Gar. In year 2013 Gyalwai Nyugu Rinpoche established Achen Monastery in Padma (Cn. Banma), the Golok region of Amdo (Cn. Qinghai), He is regarded as the incarnation of Jigme Gyalwai Nyugu. Gyalwai Nyugu Rinpoche was born in 1975 in Padma (Cn. Banma), the Golog region of Amdo (Cn.Qinghai). He was ordained at the age of fourteen in a local monastery. He received empowerments and teachings from many teachers，among whom the most important three masters were Khenpo Choekyab (1920-1997), Khenpo Jikme Phuntsok and Lama Achuk Rinpoche. His root teacher was Lama Achuk Rinpoche. The major part of his training has been within the teachings and practice of the Dzogchen Lineage of Nyingma School. At the age of fifteen, he left Padma and went to Sertar where he studied with Khenpo Choekyab for six years. In addition to discipline of the three higher trainings as big part of his study, he also received a number of empowerments and instructions of the Nyingma School. At the age of twenty one, he went to Larung Gar, the Centre for the Five Traditional Sciences and Higher Buddhist Studies founded by Khenpo Jikme Phuntsok. At Larung he received teachings within both the new schools (Kadam, Kagyü, Sakya, and Geluk) and the Nyingma school, including extensive teachings on the majority of Longchenpa’s, Mipham Rinpoche’s and Khenpo Jikme Phuntsok’s writings. 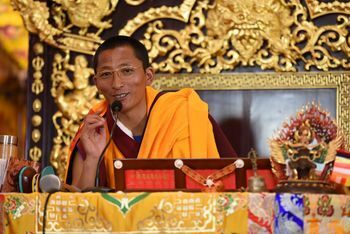 At the age of twenty six, he went to Yachen Gar Monastery where he received Longsal and Longchen Nyingtik instructions given by Lama Achuk Rinpoche. He served Lama Achuk Rinpoche and also began to teach the Sangha assembly and lay followers of Yachen Monastery in year 2001. In year 2004, Rinpoche followed Lama Achuk Rinpoche's prophecy, successfully opened the gate of the sacred mountain Phuba in Padma and revealed termas. Later in the same year, Lama Achuk Rinpoche announced him as the incarnation of Jigme Gyalwai Nyugu and empowered him as a holder of his lineage in front of the sangha assembly in Yachen Monastery, conferring on him all of the advice and instructions of the Longsal and Longchen Nyingtik of Dzogchen meditation. In year 2005, Rinpoche was enthroned as the tulku of Jigme Gyalwai Nyugu at Ka’ang Monastery in Padma. In year 2013 Gyalwai Nyugu Rinpoche established Achen Monastery and Gyalwai Nyugu Retreat Center at the request of His Holiness Katok Moktsa Rinpoche. This page was last edited on 21 April 2018, at 19:31.